As fall starts to take hold in Calvert County and the leaves turn a variety of colors, I decided that this is a good time to make my way back to American Chestnut Land Trust. The north side trailhead is just a short drive from my house. I’ve been there before with my dogs, but I didn’t find the trails that we tried (Turkey Trail and Horse Swamp Trail) to be particularly ideal, especially since my dogs tend to walk me. That isn’t a good thing if you’re hiking at the edge of a ravine. However, ACLT has flatter, wider trails that are more appropriate for us, so I set off to check those out. In particular, I wanted to walk the Double Oak Lane and Double Oak Road trails so we could avoid any issues with ticks and poison ivy. The other trails, which are more rustic, are better suited to when I don’t have my canine companions. ACLT has changed in the year and a half since my first visit there. A new barn near the parking lot now serves as an information center, offering trail maps and a place for visitors to sign in. 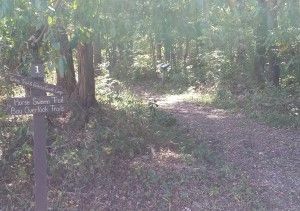 A new trailhead was recently added in Prince Frederick that connects with the north side trails (the ribbon cutting for that takes place on Oct. 22). Both experienced and novice hikers can find trails of various lengths and difficulty levels. 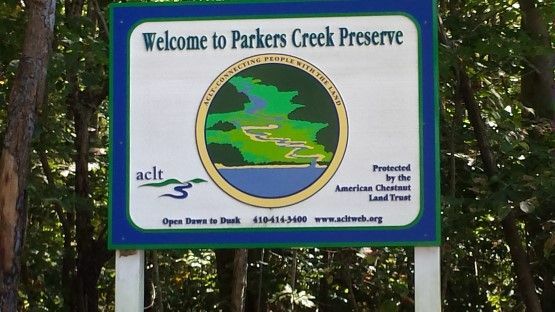 Most of the trails lead to Parkers Creek. If you bring your dog, take note that no cleanup bags are provided. ACLT is a “leave no trace” area, so you must pack everything out that you bring in. 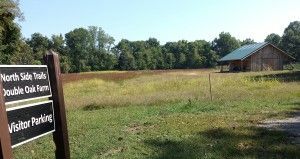 There are many good places to hike in Calvert County, but many of them also charge a fee. ACLT does not, but donations of money or time are gratefully accepted. Before you lace up your hiking boots, make sure to check the ACLT website for information about trail closures for deer herd management in the fall and winter. Happy hiking! My favorite trail in Calvert!